Jan 30, 2017: A PC for Baguette Land. Some cheese offered for each review. 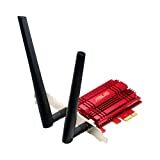 Jan 31, 2017: How to turn off 2.4 gHz band on Wifi card? Mar 16, 2017: Ready to bite the bullet, need a second sober thought. Feb 20, 2018: Build: Yea or nay? Feb 22, 2018: This may sound kind of stupid, but how do you get internet on your PC? Is a LAN cable the only way? Apr 30, 2018: 2k budget mini tower build! Aug 19, 2018: Can barely play games due to lag spikes... but my network is fine.